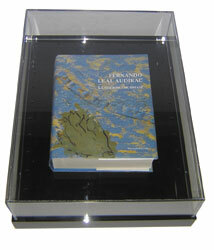 ART SORB is a form of silica gel which is wonderfully suited to the task of controlling humidity in display cases. It is a moisture-sensitive silica material which adsorbs and desorbs moisture in order to offset changes in relative humidity. Its main use is to create a suitable microclimate inside showcases placed in rooms which are either too dry or too wet or subject to a fluctuating climate. ART SORB is available in cassettes and sheets. "ART SORB" is a practical passive microclimatic control system that affords to the operators to control of the effectiveness in the time with the simple verification of the weight. Cassettes in cardboard with containing a woven side of not woven permeabile to the steam silica Art-Sorb gel. The cassettes are preconditioned to 55% UR. 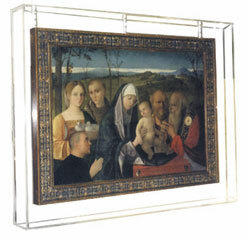 Sealed and air-conditioned showcases and frames realized made-to-measure for the transport, the conservation and the exposure of artworks. 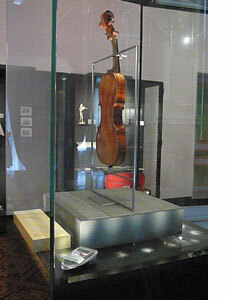 The CLIMABOX is assimilable to a museal showcase used in order protect the artwork, for which it is constructed made-to-measure. The protection is of environmental type, above all prevents from the humidity variations, the powder and polluting. The microclimatic control inside of the CLIMABOX is assured by the employment of" ART SORB". 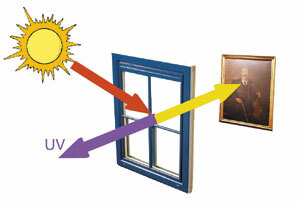 The film is placed on the window facing indoor and is first wet by water which activates its acrylic glue. Dimensions original roll: 152 cm x 30,5 mt.